Converts CSV files to HTML tables or JSON data. Is there a better alternative to Spread2Web? Is Spread2Web really the best app in HTML category? Will Spread2Web work good on macOS 10.13.4? 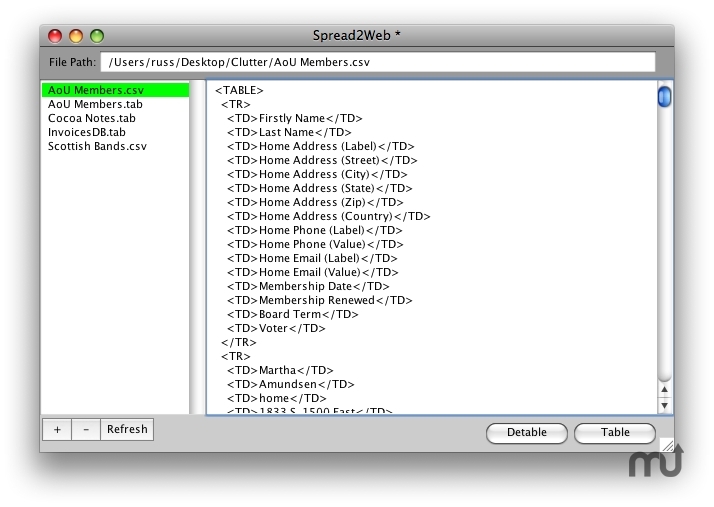 Spread2Web helps you publish spreadsheets & databases as tables on Web pages. It converts Comma Separated Values (.csv) and Tab Delimited (.tab) files to a simple, clean HTML table structure or JSON data. It streamlines the export/conversion process by remembering the files you've previously converted. When you need to re-export from your spreadsheet or database, just save your .csv or .tab file in the same location with the same name, open Spread2Web, click on the file name already in the list, and click the "Convert" button. Spread2Web is donation ware. Spread2Web needs a rating. Be the first to rate this app and get the discussion started!